Well, it's been a few weeks since this phenomenal game came out with many tidbits and aspects of the game worth discussing. I think it's about time we had a spoiler thread where those who have played can discuss this game as well as the franchise as a whole without worrying about spoilers. Naturally, if you have not played through the entire campaign yet and intend to do so do not read anything beyond this opening post. When I saw that the game is going to take place in Norse mythology, I said to myself "Loki and Hela will definitely be one of the bad guys here." 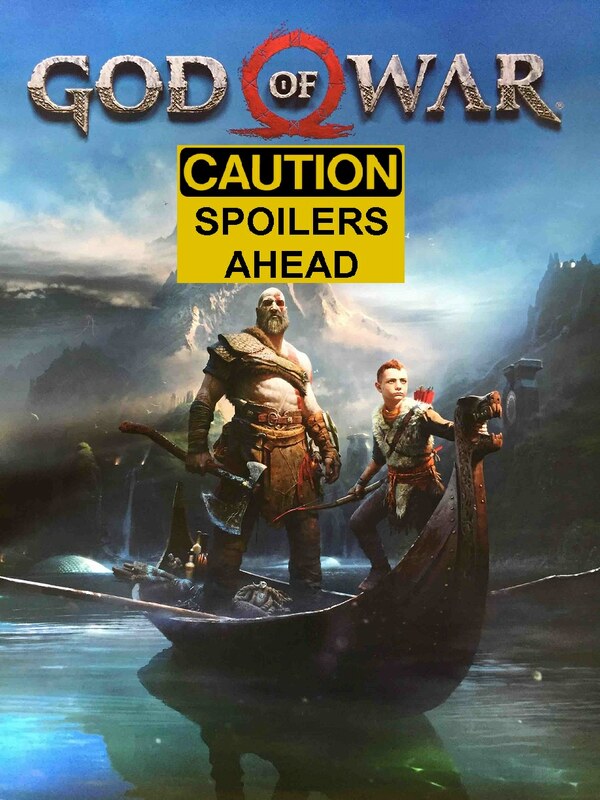 Then I remember that this isn't MCU, but God of War, where Gods are a bunch of pricks........... like Odin & Thor. The tonal shift is quite jarring. I didn't expect Atreus to be Loki this whole time. This little kind boy is this guy?? Then again, this is a setting where the legends are messed around, so I have to expect that. The game even cheekily ties to the legend where Baldur dies after getting stabbed with a mistletoe dagger, while in here he pretty much hits Atreus' mistletoe arrowhead, and then dies because Kratos stops him from killing his mom. Which in turn makes her angry at Kratos and want to kill him......... she's quite a fickle woman ain't she? When this happened I was like "why not revive your son like you did with Mimir's head??" Then the game cheekily mentioned "but then his son won't be the same as before when he's revived. She doesn't want that.". AW COME ON WOMAN! Your son's a nutjob and he's trying to kill you! Just put him in a state where he's alive and can't harm you already! Maybe in the sequel the secret is up and then everyone will call Atreus Loki, and a giant bombastic battle will take place in Asgard where you fight Thor and Odin, with the support of everyone who's decided "Odin's been a prick, let's destroy him! ", which includes Kratos, Loki, Mimir, maybe Tyr and Hela, and definitely Surtur. We'll have to wait and see what happens next, while looking at this teaser over and over again. I am intrigued by a lot of the ideas and possibilities, they get me for the first time really excited about where this could go. In that final sequence it's finally revealed that mother was Faye, a giant. It is also revealed that the boy is Loki which is why I'm guessing they kept all the information about the mother hidden until the last minute because "The boy's" identity would have been given away since he is the product of God and Giant. There is also an ominous picture at the end with the prophecy that Atreus will ultimately kill his father and Kratos... Doesn't react. It's already stated in the final battle with Baldur that Freya "Will rain down every agony. Every violation imaginable, upon you. I will parade your cold body, from every corner, of every realm, and feed your souls to the vilest filth in hell. That is my promise!" Will Freya turn Atreus against his father in an attempt at the ultimate revenge and insult? There is another intriguing possibility that's been floating around the interweb that Kratos is Tyr. It's mentioned in the lore that the battle between Jörmungandr and Thor is so shattering that it traverses time and space. Tyr is known to be a God but a friend of the giants and by extension an enemy of the Gods of which it's very clear that Kratos is, as well as being married and a father to one. Maybe Tyr is a persona that Kratos comes back in time at Ragnarok to try to broker a peace to prevent Armageddon but would ultimately fail? Kratos is highlighted as ᚠᚨᚱᛒᚨᚢᛏᛁ , which means Fárbauti. I would love to see what Faye actually looks like before she died. You have to be one badass woman to be the wife of Kratos, and she's definitely a complete badass, and quite a good person too from how everyone talks about how nice she is. Well, but through her actions she did just create the timeline to start Ragnarok...... then again, since Odin & Thor are assholes and the people that they killed like the Jotuns are actually good people that they fucked over, Ragnarok is definitely required so everyone can live a better life. As for Kratos not reacting to his prophesied death, he's probably thinking "It's better this way. I will face my death with dignity, as long as my son can live." Freya is currently under Odin's spell so she can't actually do violent acts like she used to when she's queen of the Valkyries, though I can see in the sequel that Odin will probably break her spell and manipulate her to kill Kratos. Or maybe she'll have a change of heart when she realized that what she's doing is REALLY STUPID. Hm, that one is just a wild theory & wishful thinking. Tyr is definitely another person entirely. 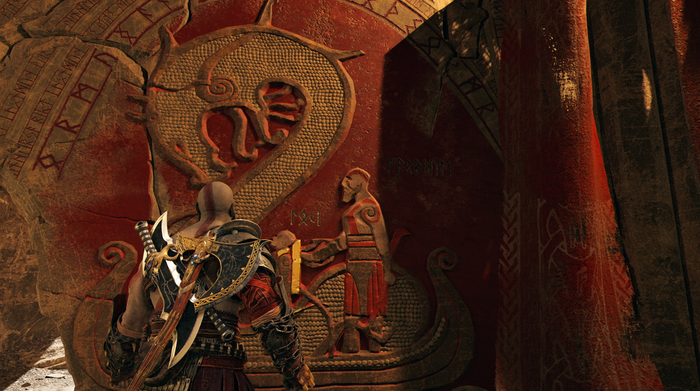 The murals after all labeled Kratos as Fárbauti already, and Tyr is the son of Odin, while Kratos is the son of Zeus. He's pretty much Kratos' polar opposite counterpart. Too bad he's dead since Odin killed him years ago because Odin is afraid that Tyr will overtake him. Man what is it with this series and completely fucked up family life? Though I would love to see if there will be time traveling in the game. I hope it'll be done in a mind blowing awesome way.